Over at E3, Sega has revealed that it’s bringing a trio of titles from the console format to PC, including two games from the Yakuza series. It’s the first time that this big-hitting franchise has debuted on the PC, and Yakuza 0 is leading the charge, with the game already up for pre-order on Steam with a launch date of August 1. 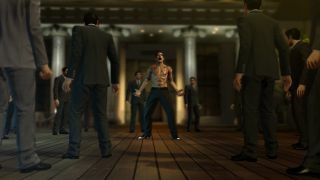 If you’ve not experienced Yakuza 0 before, it’s an open world action game based around organized crime as the name suggests, although it’s a very different experience to something like Grand Theft Auto (and it’s positively stuffed with neat little mini-games). Yakuza Kiwami – a remake of the very first Yakuza game – is also headed to the PC, again in 4K with an uncapped framerate (with no release date yet revealed, but it’s coming soon, we’re promised). As Yakuza 0 is a prequel to the series, you’re effectively getting access to the initial two episodes of the franchise here (even though these are the most recently made games), which is a pretty cool way to kick things off. Sega is also bringing Valkyria Chronicles 4, the tactical RPG, to the PC at some point later this year. Incidentally, Sega made these revelations at the PC Gaming Show as organized by our sister site PC Gamer, although don’t forget that we’ve got our own major gaming event going on right now in the form of PC Gaming Week.